Under a PT3 initiative, a framework was developed to help 34 special education preservice teachers obtain technology related skills. The framework embedded the use of three online Macromedia Flash-MX based tutorials and three handson cooperative based learning experiences. Pre- and postsurveys were used to collect data on student ability and value orientation changes. Results indicate that the framework led to a significant perceived gain in National Educational Technology Standards for Teachers (NETS-T) ability (p = .001). The preservice teachers showed no significant changes in their perceived value of technology in education. Furthermore, the findings suggest that a preservice teacher's affiliation with the constructivist or behaviorist pedagogy offers some predictability towards their value of technology in education. However, this pedagogical affiliation offers no predictability towards their technological ability. It is concluded that skill-based technology training can be done online, but that skill-based training is not enough to produce teachers who value and feel comfortable integrating technology in the classroom. Basham, J., Smeltzer, A. & Pianfetti, E. (2005). An Integrated Framework Used to Increase Preservice Teacher NETS-T Ability. 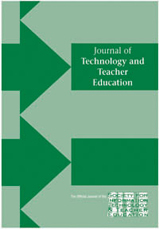 Journal of Technology and Teacher Education, 13 (2), 257-276. Norfolk, VA: Society for Information Technology & Teacher Education. Retrieved April 21, 2019 from https://www.learntechlib.org/primary/p/26101/. International Society for Technology in Education (ISTE). (2000). National educational technology standards (NETS) for students: Connecting curriculum and technology. Eugene, OR: Author. National Center for EducationS ta t is t ics (NCES). (2000). Teacher use of computers and the Internet in public schools (NCES 2000–090). U.S.
Office of Technology Assessment (OTA) (1995). Teachers and technology: Making the grade. Washington, DC: U.S. Government Printing Office.